Abacavir sulfate is Ziagen's generic name. This medication is available in tablets and oral solution, and is used to treat the HIV-1 or the human immunodeficiency virus. 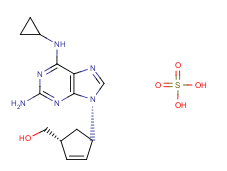 As an antiretroviral agent, abacavir sulfate is also found in Trizivir and Kivexa/Epzicom, and is normally used in combination with other antiretroviral medications. Abacavir only helps slow down the reproduction of the HIV-1 virus, but cannot cure or prevent HIV or AIDS. This medication keeps the HIV from destroying the immune system, thus it also lets the body stay healthy in longer periods when taken on a regular basis. It does not, and cannot prevent the HIV to spread via sexual contact and contaminated blood. Thus, there should be precautional measures. Abacavir generally does not cause any serious side effects on its users, although some could experience a rare hypersensitivity reaction, such as fever, rash, vomiting and nausea, abdominal pain, diarrhea, fatigue, difficulty in breathing, cough or sore throat. Other signs of hypersensitivity include liver or kidney failure, numbness or tingling sensation, conjunctivitis (sore eyes), lethargy (sluggishness) and even respiratory failure. Should you be experiencing any of these while taking the medication, stop using it and seek the doctor. However, the list of adverse reactions does not end there. There are also other side effects such as sleeping problems and/or vivid dreams, throat infections, increased risk of heart attack, diarrhea, depression, loss of appetite, white spots in the mouth, pneumonia, Stevens-Johnson syndrome, pink-eye, skin blistering and many others. The use of this medication has no reported negative effects among pregnant women, although animal studies show that Abacavir, when taken in high dosages could have some negative effects to fetuses. Thus, Abacavir could only be taken by pregnant women, if the doctor finds out that the benefits outweigh the risks. Although it is not yet known if the medication could be transmitted through breast milk, HIV positive mothers should refrain from breastfeeding their babies. The virus could be transmitted to the child this way. HIV-positive children ages three months to sixteen years could take the medication, but with the doctor's advice.